Mass Effect: Andromeda takes place a galaxy away from the Reapers and Cerberus*, which means it needs some new villains. 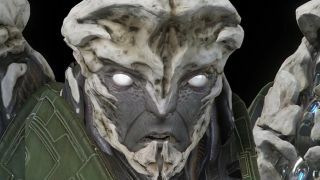 The N7 day reveal trailer gave us a few sideways glances at the antagonistic alien race known as the Kett and a new video from Game Informer finally shows them handlebar-head-on. The Kett are meant to look distinct from the Milky Way species you're already familiar with, Mass Effect Andromeda art director Joel MacMillan explains in the video: sleek, geometric forms are out and craggy, bony bodies are in. But even with all the bone plates, the Kett still have to look familiar enough to promote empathy when the story calls for it. Take a look at the final design for one member of the species and see what you think. Still wondering what the deal is with that giant basketball hoop on the back of that one Kett's head? Prominent head crests are a unifying element for the diverse species, MacMillan noted. "He's got that big, kind of collar piece that winds around the back of his head," MacMillan said. "All the creatures that you might see in the Kett have a very similar feature to that. It's something that we played on as a consistent motif or a consistent element across that lineup." *Oh dang, I bet Cerberus snuck some moles into the Andromeda Initiative and they're going to mess stuff up for all of its cross-species efforts.